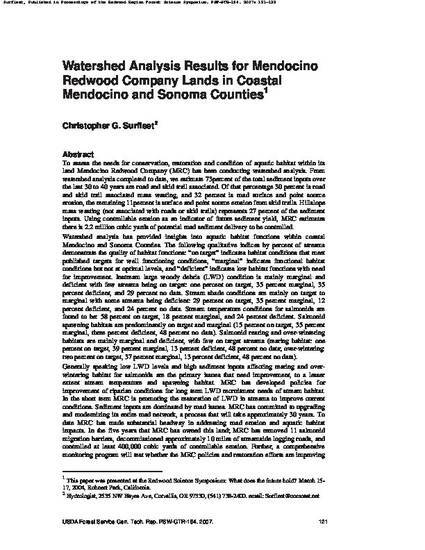 To assess the needs for conservation, restoration and condition of aquatic habitat within its land Mendocino Redwood Company (MRC) has been conducting watershed analysis. From watershed analysis completed to date, we estimate 73percent of the total sediment inputs over the last 30 to 40 years are road and skid trail associated. Of that percentage 30 percent is road and skid trail associated mass wasting, and 32 percent is road surface and point source erosion, the remaining 11percent is surface and point source erosion from skid trails. Hillslope mass wasting (not associated with roads or skid trails) represents 27 percent of the sediment inputs. Using controllable erosion as an indicator of future sediment yield, MRC estimates there is 2.2 million cubic yards of potential road sediment delivery to be controlled. Watershed analysis has provided insights into aquatic habitat functions within coastal Mendocino and Sonoma Counties. The following qualitative indices by percent of streams demonstrate the quality of habitat functions: “on target” indicates habitat conditions that meet published targets for well functioning conditions, “marginal” indicates functional habitat conditions but not at optimal levels, and “deficient” indicates low habitat functions with need for improvement. Instream large woody debris (LWD) condition is mainly marginal and deficient with few streams being on target: one percent on target, 35 percent marginal, 35 percent deficient, and 29 percent no data. Stream shade conditions are mainly on target to marginal with some streams being deficient: 29 percent on target, 35 percent marginal, 12 percent deficient, and 24 percent no data. Stream temperature conditions for salmonids are found to be: 58 percent on target, 18 percent marginal, and 24 percent deficient. Salmonid spawning habitats are predominantly on target and marginal (15 percent on target, 35 percent marginal, three percent deficient, 48 percent no data). Salmonid rearing and over-wintering habitats are mainly marginal and deficient, with few on target streams (rearing habitat: one percent on target, 39 percent marginal, 13 percent deficient, 48 percent no data; over-wintering: two percent on target, 37 percent marginal, 13 percent deficient, 48 percent no data). Generally speaking low LWD levels and high sediment inputs affecting rearing and overwintering habitat for salmonids are the primary issues that need improvement, to a lesser extent stream temperature and spawning habitat. MRC has developed policies for improvement of riparian conditions for long term LWD recruitment needs of stream habitat. In the short term MRC is promoting the restoration of LWD in streams to improve current conditions. Sediment inputs are dominated by road issues. MRC has committed to upgrading and modernizing its entire road network, a process that will take approximately 30 years. To date MRC has made substantial headway in addressing road erosion and aquatic habitat impacts. In the five years that MRC has owned this land; MRC has removed 11 salmonid migration barriers, decommissioned approximately 10 miles of streamside logging roads, and controlled at least 400,000 cubic yards of controllable erosion. Further, a comprehensive monitoring program will test whether the MRC policies and restoration efforts are improving aquatic habitat and resource conditions.